11/16/2014Share this story on Facebook! For those of you interested in LGBTQA+ issues, activism, or for those who simply want to learn more, Ithaca College's Center for LGBT Education, Outreach, and Services is a great resource. The center is located on the lower level of Hammond Health Center and offers personal support to those in or allied with the LGBT community. Throughout the year, they also host and sponsor several LGBT-related activities aimed at promoting awareness, understanding, and appreciation of people of all genders and orientations. The center is open Monday-Friday, 8:30 a.m.-5 p.m., so drop by and see what you can learn! I got to the lecture hall a solid 35 minutes early to ensure that I’d get a good seat. The room was relatively empty when I got there, but by the time she showed up, every seat was filled and people were lining the walls. The air was hot with skin, breath, and admiration. Alison Bechdel visited Ithaca College on October 8, and I couldn’t believe I was getting the opportunity to hear from the author of the comic strip “Dykes to Watch Out For and creator of the Bechdel Test, a way to tell if literature or film contain a gender bias. 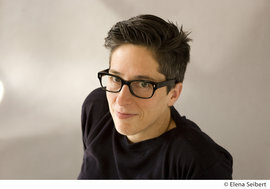 As a fellow writer-type and feminist, I idolize Bechdel not only for her innumerable contributions to the fight for equal rights for the LGBTQA+ (“A” stands for asexual, and “+” covers anything the acronym may have missed) community, but also for her dedication to self exploration through the written word, her fearlessness in working within a still-burgeoning genre, and her emotional openness with her audience. For a glorious 90 minutes, Alison kept her audience as attentive as those annoying seagulls in Finding Nemo. We hung on her every word, from her touchingly awkward first lines (“I got so excited my mic flew off! It’s so crowded!”), to her candid explanation of her difficulties with sexuality, to her humble and almost reluctant admission of receiving the MacArthur Genius Grant earlier this year. She took us through her life’s journey, from her morbid and confused childhood fascination with The Addams Family cartoons to the opening of Fun Home, the new Broadway musical based on her graphic novel memoir. She detailed her issues with the portrayal of sexuality in the media, familial relationships, and her relationship to language and images with such honesty, I felt as if she were speaking in confidence to us. Her sincerity on the page transferred beautifully to her speech. I waited patiently to shake her hand, and as I tend to do, I blubbered something generic about admiring her work and what she stands for. She smiled at me pleasantly and dutifully signed a page in my notebook by drawing a profile of the cartoon version of herself I recognized from her web comics. I exited the room and make my way home inspired, humbled, and invigorated.